Our partner school in this destination, Brighton Languages ​​College, organizes courses for 12-17 year olds, which include classes, accommodation on a full board basis and a very complete package of activities. Aside from the very popular summer program, this school offers courses and activities in winter and spring too. The school is located in the heart of Brighton, just a 2 minutes walk from Roya Pavillion. Pre-evaluation of the student’s level through an oral and/or written test to place them at the appropriate level according to the result. Normally, this test is done on the first day of school. Beginners (without any knowledge of the language) may not need to take this test. Brighton's youth program includes a series of activities and excursions both in the afternoon and in the evening. Here are some examples: ghost tour, visit to Lewes Castle or Brighton Pier, ice skating (in winter), student disco, Marina Boat Trip. On Saturdays, full-day excursions are organized to nearby cities such as London, Cambridge or Oxford. Supervision: 24 hours / 7 days a week. Airport transfer: this service is not included (see rates in our online price list). Other extras: the weekly bus voucher is included. The program consists of 20 or 32 lessons per week. The first part of the classes is devoted to reinforcing grammatical structures and written expression. Following lessons focus on improving oral expression and listening comprehension. During classes, roll games and dramatization exercises are used and special emphasis is placed on oral communication. The class schedule varies by week: one week you will have morning classes and afternoon activities, and the following week, you will start with activities in the morning and you will have classes in the afternoon. Brighton's youth package includes a program of activities and excursions, for example: sports (soccer or beach volleyball), bowling, kayaking, climbing, youth nightclub or fish and chips. On Saturdays, an entire day's excursion is organized to nearby cities such as London or Chichester. The 20-weekly lessons course includes 4 half-day activities, 3 afternoon/evening activities, 1 half-day excursion and one full-day excursion per week. With the course of 32 lessons per week, you have fewer activities (due to the course schedule). Note: if you need to book the UM (Unaccompanied minor service) this has a cost of € 79. Please indicate on the booking form in case you wish to receive this. Are you looking for an English program for juniors in the spring? If so, Brighton's youth course, held during Easter, is an ideal option. Lessons: 20 lessons per week (15 real hours), from Monday to Friday. There is a maximum of 15 students per class. The program consists of 20 lessons per week (15 hours in total). The first part of the classes is devoted to reinforcing grammatical structures and written expression. Following lessons focus on improving oral expression and listening comprehension. During the classes, roll games and dramatization exercises are used and special emphasis is placed on oral communication. 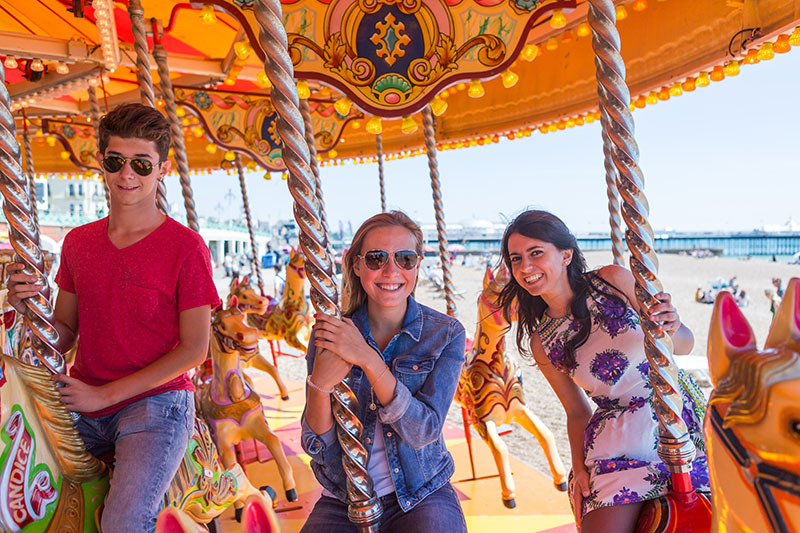 Brighton's youth package includes a program of activities and excursions, for example: ghost tour, visit to Lewes Castle or Brighton Pier, sports (soccer or volleyball) or fish and chips. On Saturdays, an entire day's excursion is organized to nearby cities such as London or Chichester. Are you looking for an English program for juniors in winter? If so, Brighton's youth course which takes place between January and February is an ideal option. Other extras: a weekly bus pass is included. The program consists of 20 lessons per week (15 hours in total). The first part of the classes is devoted to reinforcing grammatical structures and written expression. Following lessons focus on improving oral expression and listening comprehension. During the classes roll games and dramatization exercises are used and special emphasis is placed on oral communication. Brighton's youth package includes a program of activities and excursions, for example: ghost tour, visit to Lewes Castle or Brighton Pier, ice skating, fish and chips. On Saturdays, an entire day's excursion is organized to nearby cities such as London or Chichester. Junior students will stay in carefully selected English families. The room is shared with a student of another nationality. Families live an average of 20-30 minutes from the school by public transport, with a maximum distance of 40 minutes. A weekly bus pass is included in the price. If you have to take public transport to get to the school, you may not be able to participate in the evening activities, because some local bus services end at 9:00 p.m. or 10:00 p.m. The meal plan is full board (breakfast, lunch package and dinner). If you book the intensive summer course or the flight and monitor course, a hot lunch is included from Monday to Friday in a school cafeteria. The family does the laundry for the students once a week.